(Chicago, IL) - In a small section of concrete where Chicago’s Schiller and Wells streets intersect lies a manifesto so inconspicuous that people walk over it every day blind to the power beneath their feet. 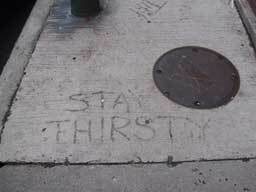 The etching reads “Stay Thirsty.” This inscription inspires an insatiable rock n’ roll lifestyle and is the guiding tenet behind the publication, Thirsty, which launched in September 2006. “Stay Thirsty” is more than an idea. It is a call to arms. Founded on the philosophy of Ryan Licht Sang, a shining young musician, artist and writer who passed away at the age of 24, “stay thirsty for life” is Thirsty’s clarion call to shine a spotlight on creativity in all forms from around the world. Operating from a truly virtual platform, Thirsty’s grasp starts at street level and continues underneath, where the most deserving music, art and writing resides. Thirsty’s pull draws upon the insights, impressions, opinions and expertise of its artists without regard for convention. We invite you to slip beneath the cracked cement of society’s streets and discover the pulse of the underground. We invite you to Stay Thirsty.